Soccer (football for those on the other side of the world) fans have rejoiced at the dramatic outcomes of the 2018 FIFA World Cup. No one could have predicted the final four teams or the unlikely heroes who have emerged. As a soccer fan myself, I can't think back to a more exciting World Cup tournament. Fans have been spoiled by incredible goal scoring, penalty shootouts, late game drama and marvelous crowd/fan atmospheres. One of the great things about watching this tournament is the world class players who participate. With players such as Cristiano Ronaldo, Leonel Messi, and Neymar, fans can expect to see incredible performances from these players. It is even better when we get to see great finishes by players who aren't well known amongst amateur fans. This type of goal scoring can make soccer fans out of anyone. I couldn't leave out this incredible goal from France's Benjamin Pavard. Did you know penalty shootouts were implemented in World Cup play in 1978, as a tie-breaker? Well the penalty shootout has been the most exciting thing to watch during this tournament. Once the Round of 16 commenced, we the fans, were treated with drama filled matches. In my time of watching the World Cup, I couldn't remember witnessing so many shootouts in a knockout stage. I went as far back as 1998, and my assumption proved to be correct. The 2018 World Cup has the most penalty shootouts with four (4), before reaching the World Cup Semi-Finals. The 2018 World Cup has stood out to many fans because of the late match dramatics. During group stage play, there were 14 matches that came down to a match tying/match deciding goal within the last 10 minutes. Keep in mind there were 48 matches played during the group stage round, which means that nearly 30% of the matches played were decided at the end. Which fan doesn't like late game (match) drama? As sports fans, we all thirst for this type of drama because we are interested to see which player will come up clutch, not for their team but in this case, for their country. The knockout stage has provided a similar result. Out of 12 matches played, 5 matches were decided by a late goal and/or penalty shootout. I am always captivated by the fan atmospheres at soccer matches. The manner in which they unite and cheer for their teams is quite unique and unlike any other. There is no better sound than vuvuzelas and horns blowing, fans singing their national anthems and heckling opposing players. A ton of energy and passion is brought to each and every match and they make sure to dress for the part. In watching this tournament, we have seen the faces of defeat and the faces of victory. Most recently, we saw some of the most apparent faces of defeat when Russia was eliminated by Croatia in penalty shootouts. I can't help but feel sorry for Russian fans when they had to witness their team lose in such stressful fashion. As a spectator of the match, I feel the anxiety of a penalty shootout but I am sure as a fan of the team playing, it intensifies by 1,000! You don't necessarily need to be in Russia to experience "fandemonium." Worldwide, fans are excited for the start of this tournament. No matter where you go, you always come across a TV showing a game, fans watching from their phones, or news of soccer matches posted all over social media. Just imagine what the United States, Mexico, and Canada will be like in 2026. With four teams remaining, fans will have the opportunity to watch great matches. 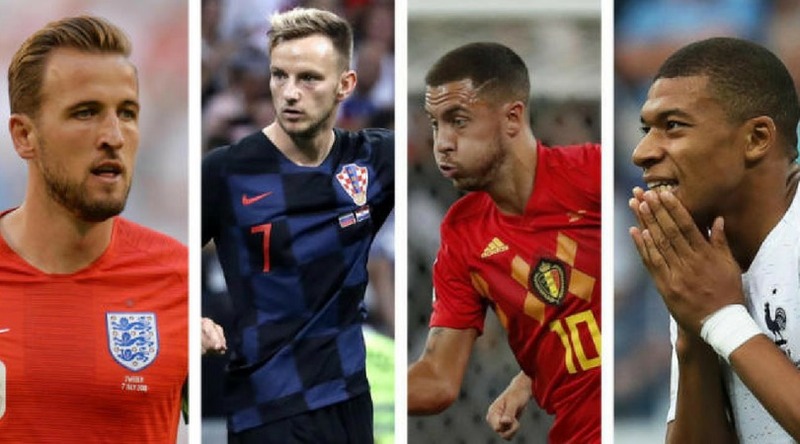 It has been quite some time since we have seen France, Belgium, England, and Croatia in the semi-final round. Kylian Mbappe is one of the players who has emerged as a World Cup star. Mbappe brings a ton of speed and finesse that results in a lot of plays in the box. In addition to that, Mbappe is an excellent finisher from close range and doesn't panic when multiple players are on him. His level of play has cause plenty of damage to his opponents along the way. Lukaku is a strong goal scorer for Belgium, delivering on 4 goals this tournament. He is remarkably fast for his size, which allows him to get through defenders and score on the run. Like Mbappe, Lukaku also proves to be a danger in the box by finishing with the header. As well as quickness, Lukaku is a strong player, who is hard to bring down. He will run and control the ball from the middle of the field and look for the open man. Harry Kane currently leads all goal scorers for the Golden Boot award. Although half of his goals came from penalty shots, Kane is a strong attacker, which forces defenders to take him down. Kane also has a knack of finding the ball and tapping it in. The main reason why England has advanced this far has been because of Kane's play. Finding a way to stop Kane will prove to be the best chance against England. Unlike the previously mentioned footballers, Modrić is the only midfielder of the group. Although Modric is not in a position to score frequently, he finds a ton of ways to create goal scoring opportunities. Every now and again he will find his way in the box and score. In my opinion, Modric is a player to watch because of his ball distribution. In addition to having a keen eye for his teammates, he has great ball control and dribbles through defenders with ease. Modric's ball skills are so good that he attracts multiple defenders, allowing him to pass to the open man. The World Cup Final Will BE Held Sunday, July 15th at 9:00 AM MST.